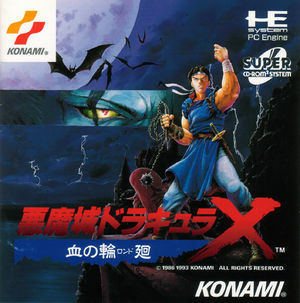 Castlevania: Rondo of Blood (悪魔城ドラキュラX 血の輪廻 (ロンド) Akumajou Dracula X: Chi no Rondo, lit. Devil's Castle Dracula X: Rondo of Blood) is a platform video game developed by Konami for the PC Engine. It is set in the fictional universe of the Castlevania series, where the protagonist Richter Belmont goes to save his lover Annette, who was abducted by Dracula. Due to the enhanced capabilities of the PC Engine CD-ROM² with the Super System Card which greatly expanded the PC Engine's memory, anime cutscenes and voice acting were added to the game. It was released in Japan on October 29, 1993. A direct sequel to it, the critically acclaimed Castlevania: Symphony of the Night, was released in 1997. The graph below charts the compatibility with Castlevania: Rondo of Blood since Dolphin's 2.0 release, listing revisions only where a compatibility change occurred. This page was last edited on 2 January 2018, at 06:22.